Eastern red cedar (Juniperus virginiana); by Alex Melman on Flickr (noncommercial use permitted with attribution / share alike). The eastern red cedar is is a sacred tree of the Native American Cherokee peoples. Also called red cedar, eastern juniper, red juniper, pencil cedar, or aromatic cedar, this evergreen is indigenous to the entire state of Tennessee and was one of the earliest landscape trees used by early pioneers. 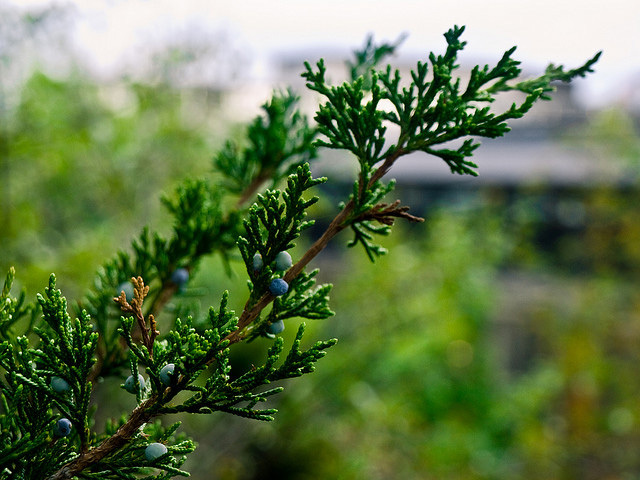 According to the Tennessee Blue Book, "The tree, Juniperus virginiana, was central to one of the earliest forest industries in Tennessee, the cedar pencil industry. It is an integral part of an eco-logical niche called cedar glades." "Cedar Knob" was the name of the land on which the Tennessee state capitol was built, and the street at the foot of the capitol was called Cedar Street (now Charlotte Avenue).